They passed out / of the sight of / men by the path / of duty and self / sacrifice. 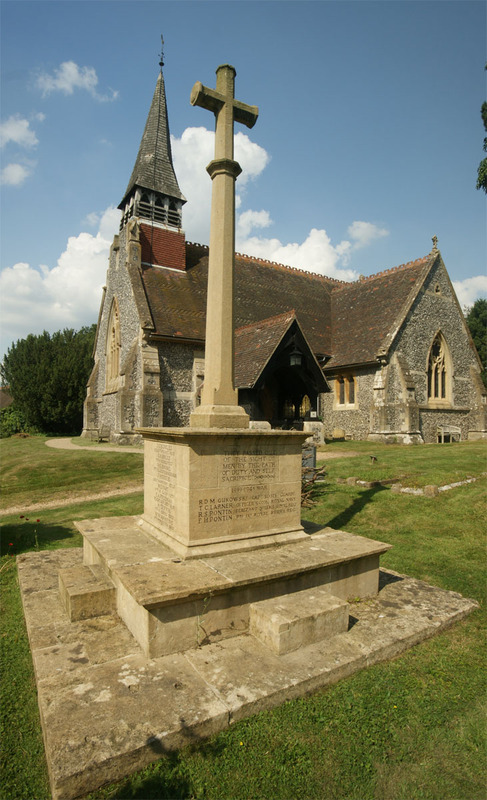 Woolhampton War Memorial – Dedication Service, 13 Mar 1921. J G Bowles, 2nd Lieut, South Lancs Regt. G H Briggs, Pte, Royal Berks Regt. H E Brooks, Pte, Coldstream Guards. J H Currie, Lieut, Hants Regt. W Ewart, Gunner, Rl Garrison Artillery. E A Freeman, Flight Sub-Lieut, RN. H Griffin, Pte, Royal Berks Regt. W W Hawkins, Pte, Worcester Regt. W E Mundy, Corpl, Hants Caribiniers. T N Sidwell, Lce-Corpl, Royal Berks Regt. E C Stagg, Pte, Cheshire Regt. J H Stagge, Pte, Royal Berks Regt. R Stevenson, Pte, Dublin Fusiliers. A Thompson, Pte, Hon Artillery Coy. W G F Wiseman, Capt, Lincolnshire Regt. A notable feature of the service in the Church was the uniting in worship of Churchmen and Nonconformists, for in addition to the Rector, the Rev H F Freeman and the Rev E D S Bushnell, Vicar of Beenham, the Pastor of the Newbury Congregational Church, the Rev A H Fowler, also took part, reading the lesson. So large was the attendance that many were unable to gain admission. The service commenced with the hymn, "O God our help in ages past." Then, after the opening sentences followed the Psalm, "I will lift up mine eyes." The Nunc Dimitis and the Apostles Creed followed the reading of the lesson, the service in the Church being concluded with the singing of the hymn, "For all the Saints." It was a large assemblage which gathered round the memorial for the unveiling, including the clergy, the parishioners, the 1st Woolhampton Troop of Girl Guides in uniform, under the leadership of Lilian Marshall and Caroline Lawrence, and by their side Buglers G Allen and R Fennell, of the Royal Berkshire Regt. At each corner of the memorial were placed groups of arum lillies and other flowers, together with many wreaths at the base. Following the responses and a prayer by the Rector, the hymn, "Ten thousand times ten thousand," was sung. Then Brigadier Phipps Hornby, VC, CB, CMG, stepped forward and unfurling the Union Jack, displayed to view the memorial. In his address, General Hornby said they had assembled to do honour to the men of Woolhampton who had given their lives for their King and Country. They were some of the men who stood between their country and what might have been had the Germans won the war - a terrible disaster; and the only way in which they could shew their gratitude to them was by rendering their names immortal. He said "some of the men" because he thought they were oft apt to forget the great obligation they also owed to the survivors, whose heroism was no less significant that that of those who fell to save their nation. He was quite sure that the spirits of the dead men, who were with them, though they could not see them, would wish them also to honour their living comrades. Many of those who had been spared were out of work and in dire distress. It was quite right and natural they should mourn their loss, yearn for their dead, and long to have them back with them; and yet they ought not to pity them, but envy them, because they had reached perfect peace and happiness. Memorials were being raised to all parts of the country, and they were a token of respect, love and gratitude to those whose memories they were set up to record. They were also a legacy and heirloom for this and future generations to preserve. About seventy men from the village served in the war, and fifteen had sacrificed their lives, which was quite a large proportion. The Brigadier-General then spoke a few words to the children, asking them to treat the memorial with respect, and always to remember what it represented. Following the unveiling ceremony, the Rector dedicated it as follows: "In the faith of Jesus Christ, we dedicate this Cross to the glory of God and in memory of his servants: in the Name of the Father, and of the Son, and of the Holy Ghost." He then read out each name as it was inscribed upon the memorial. The hymn, "Abide with me," the Blessing and the National Anthem concluded the service. The ceremony close impressively with the sounding of the Last Post by the Buglers.